Yesterday was quite the adventure beginning with a four-hour hike up and down some pretty serious hills seeing views like the one below. We were stepping lively in order to meet our boat pick up so we could get back to Picton. You haven’t heard from me in a few days because we have been tucked away in an isolated place with very limited internet access. It was dial-up and could only be accessed from 4-6 pm each day. I almost broke out in hives when I discovered that which is a clear sign that I am way too attached to my internet connection. 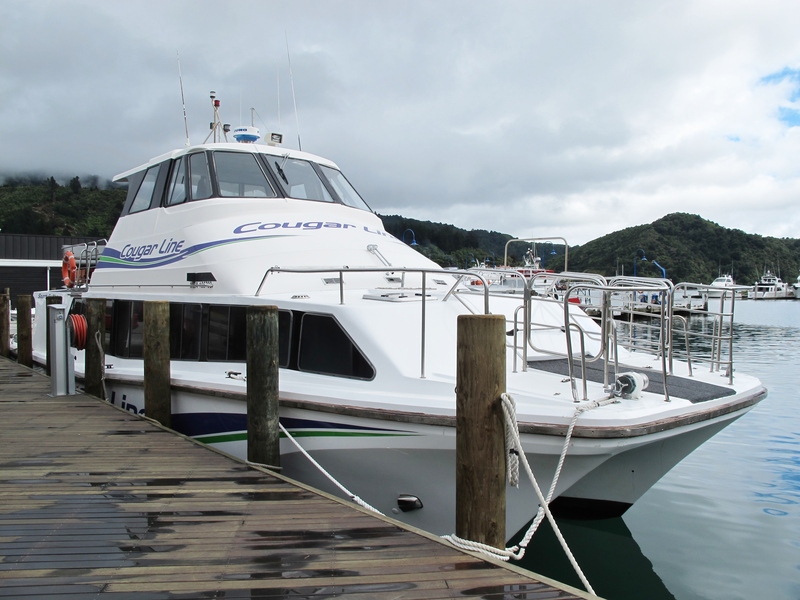 The Cougar Line (no jokes please) is the boat that picked us up and later brought us back from a location so special it deserves a post of its own later. Note the front of the boat. You can’t see it, but a door lifts up and opens allowing people to walk up steps from the inside to the deck above. Three guesses where I was when the boat slowed and the hatch opened? 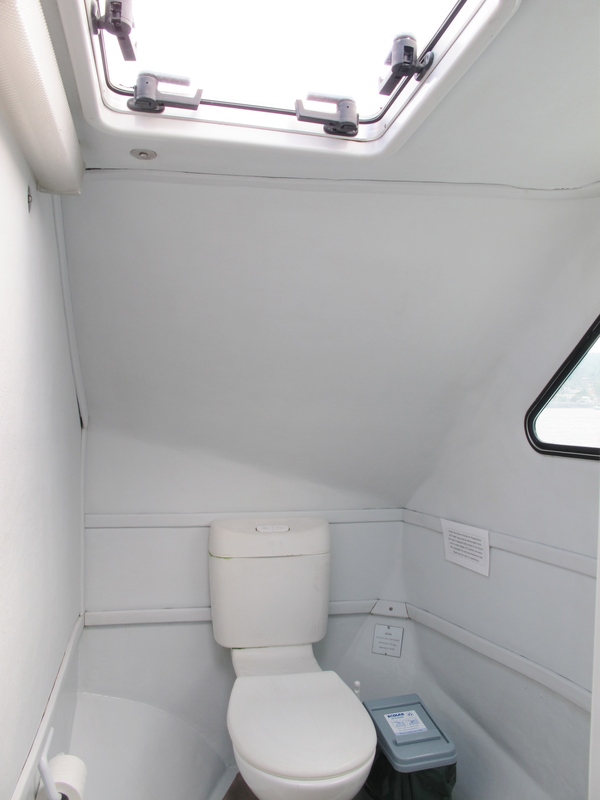 Do you see the skylight opening above the toilet … when people climb up those steps and stand on the walkway they are right over the skylight and able to look down into the ladies toilet. We were safely far enough from shore that I thought I had time to whip into the loo for a quick break before reaching our next passenger pickup stop. 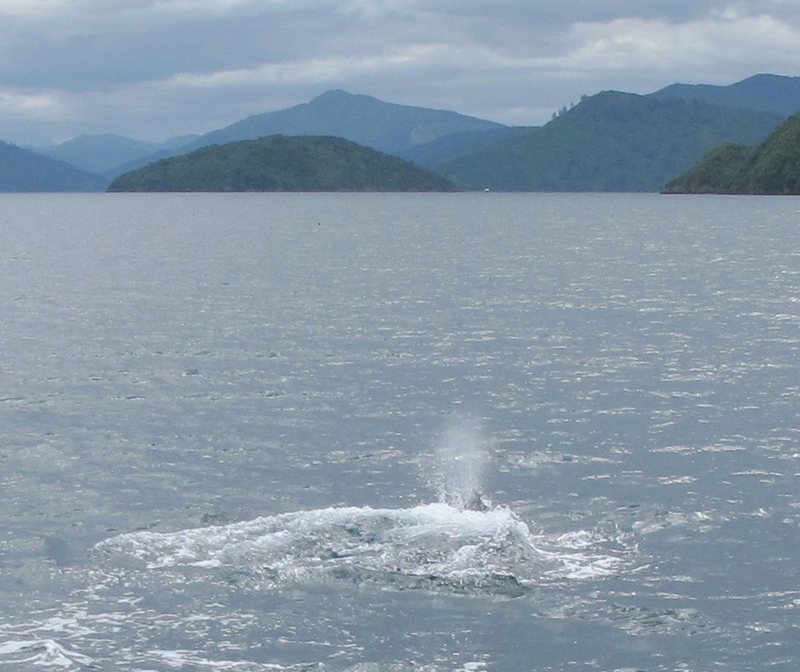 Imagine my surprise when we slowed down and I saw a head appear above me. Any concern I had was quickly forgotten by the sight that greeted me on my hasty exit from the toilet. As you can see no one was really paying ANY attention to me. When I stepped out, I saw that our boat was surrounded by about twenty dolphins who were having a great time jumping in and out of the water. 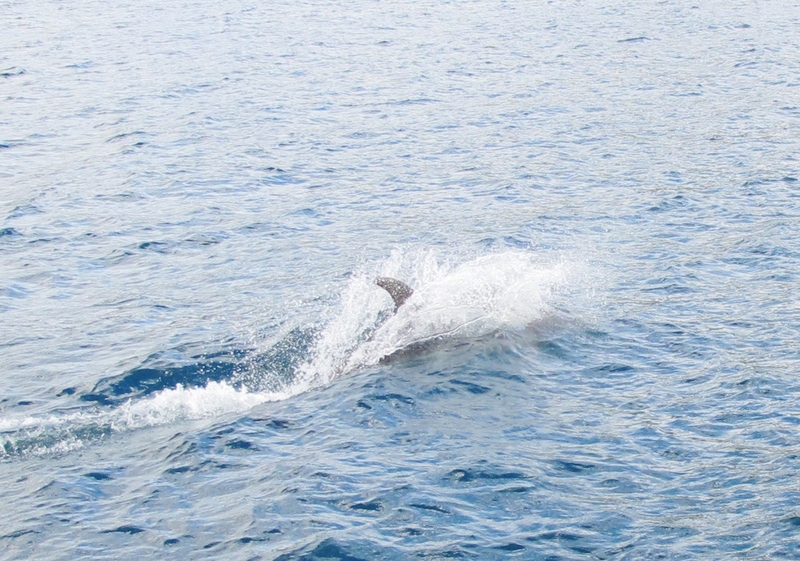 See the dolphin breathing above … they were so playful swimming right next to the boat as you can see below. I was giggling like a little girl at times because I was tickled to see them so close. 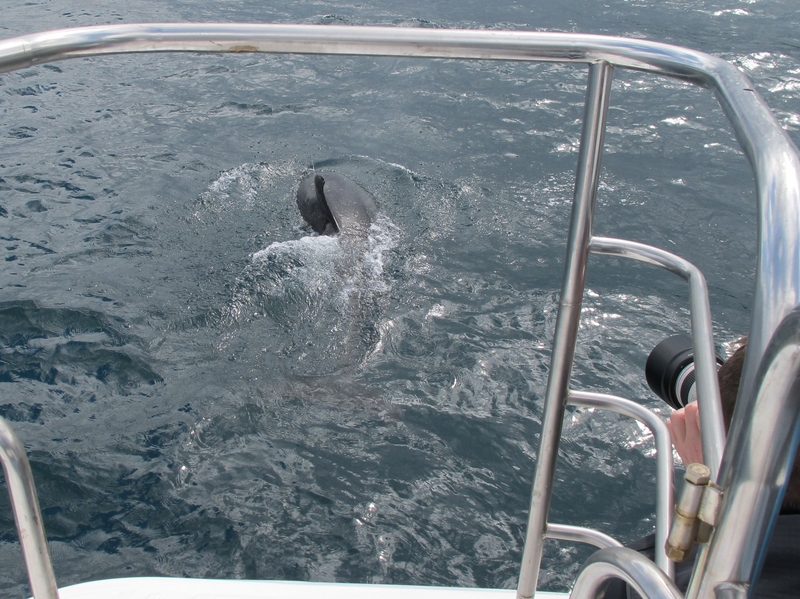 The photograph below gives you idea of how close they were to the boat and there were times they got even closer. I was surprised how close! 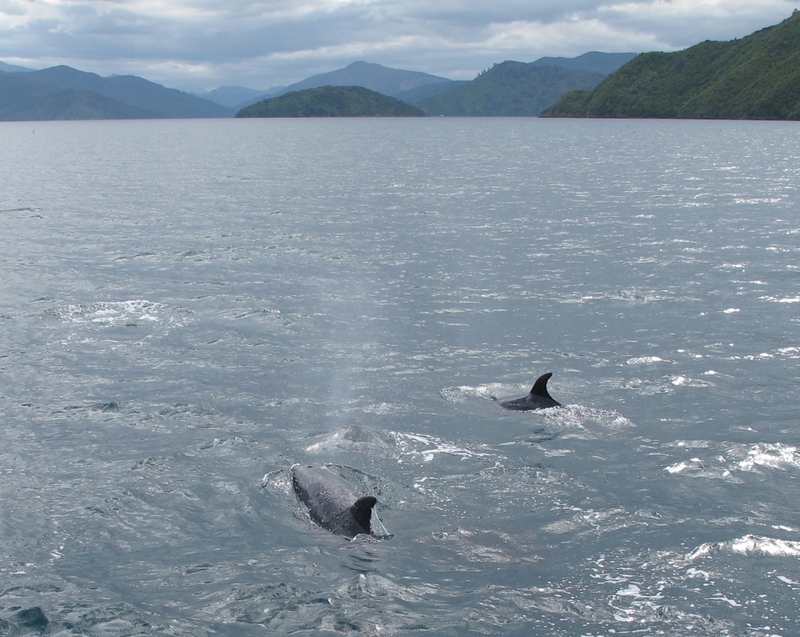 As the boat began to leave the area, some of the dolphins seemed to want to stay with us and picked up speed swimming along beside us for a short while longer. It was a highlight seeing so many at one time. I’ve seen a few in the past, but nothing like yesterday. I will try not to let so much time pass before my next post, but some of you will be cooking and eating turkey with friends and family in a day or two so you won’t be reading blogs anyway. It will be Thursday here in about three hours and while I doubt I’ll be having any turkey or dressing I will spend some time thinking about all the people and things in my life that I am thankful for. I don’t have to have Thanksgiving to recognize the gifts in my life and I hope whether you celebrate Thanksgiving where you are or not, that you have the gifts of friends and family around you each day. 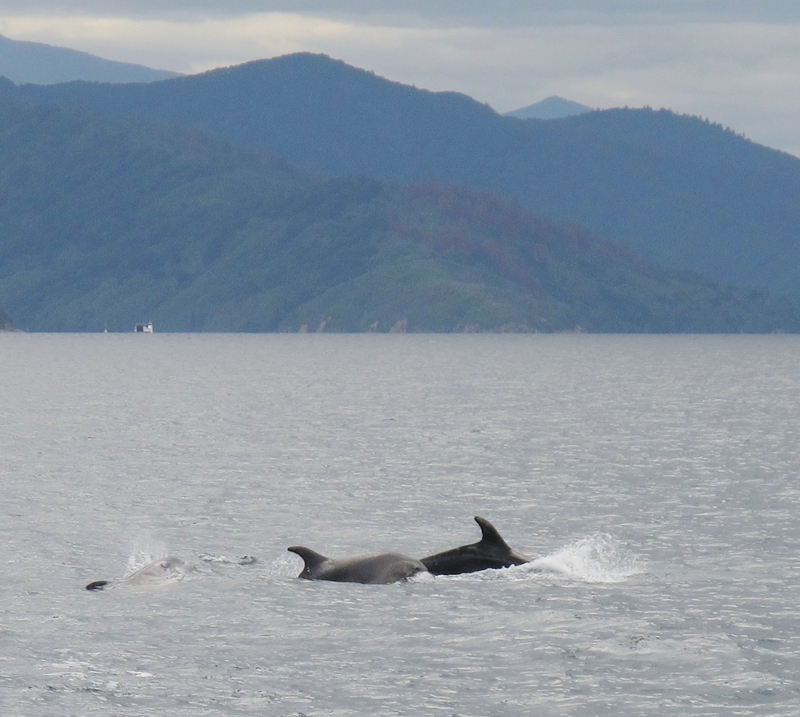 This entry was posted in Adventure, Life in General, Photography, Travel and tagged Dolphin Sightings, Dolphin Watching, Elizabeth Harper, Gifts Of The Journey, New Zealand, Queen Charlotte Sound, South Island, Thanksgiving, The Cougar Line. Bookmark the permalink. What a lovely veiw in your first shot. As for the dolpohin ones, you lucky person! I wouldn’t mind no internet with experiences like that! Have a wonderful Thanksgiving Elizabeth! And enjoy the time away from your computer! So many chuckles in one post. Cougar line, the toilet ‘show’ and you having been in withdrawal from the internet. I can so relate to that one. The dolphin experience sounds amazing! One of the items on my life list is to swim with dolphins (in the wild). Diving off the north east coast of Australia on the barrier reef, we were in a knackered old boat with a platform at the back on a level with the water, that allowed us rookies to heave ourselves out of the briny air tanks and all, onto a drier resting place, to gather our strength before going up the ladder to get on board the boat itself. One day, 3 dolphins decided to join the fun, and after their synchronised jumping display, came up and rested their heads on the edge of this platform going ‘errk erk erk erk’ just like Flipper. They would ride in the prow wave as well, clearly able to go a hell of a lot faster than our measly boat! Such funny creatures, and so much fun to watch and interact with. YOu can’t help but smile. And of course they look like they are smiling right back. You were lucky to find so many and also, that they were a distraction on your behalf!! What an amazing adventure. I want to be you when I grow up. Beautiful photos. What an incredible adventure you are having. I would so love to do the same myself but being part of it with you through your stories and photos is good enough at the moment. You are right about Thanksgiving. Not so much a day on the calendar as a way of thinking. Enjoy your wonderful trip. Once again, more beautiful photos and a wonderful adventure! I admire your life too. Happy Thanksgiving week! 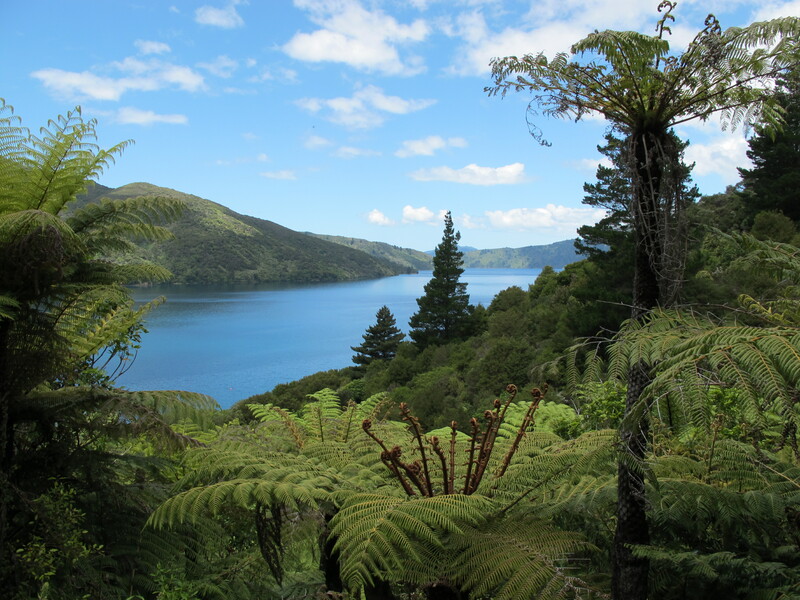 I picture you and John working your way down the South Island … enjoy that spectacular scenery and all the amazing experiences I’m sure you’re having. Cheers from Paris and happy travels. The first time I was without Internet service was at a remote cottage in Ontario. 4 or 5 days with no internet! I wasn’t the only one suffering withdrawal! No cell phone either! I love dolphins. I have only seen several in the Gulf of Mexico when I was on a car ferry and the captain didn’t like the dolphins because they would get too close and get hurt. Your pictures are amazing and I am grateful for whatever you put up!